Hey there! It's been a busy weekend so far! I spent my Sunday doing all the things that often get neglected during the work week - cleaning, dishes, laundry - plus some holiday prep. I made my deviled eggs and brownies from scratch. I never even had a chance to sit down for any crafting, but this card was done and ready to be blogged. 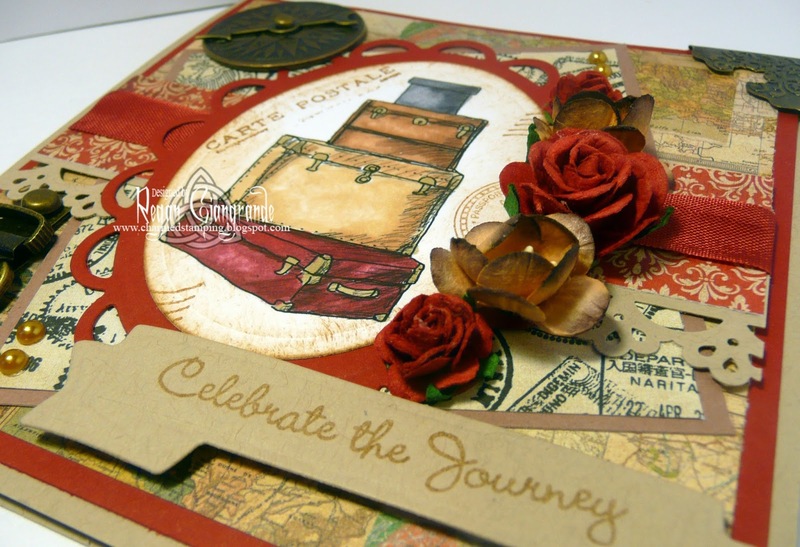 It's an anniversary card for a couple who like to travel. I colored Tiddly Inks' Suitcases with my Copics and cut it using the Classic Ovals Nestabilities (Spellbinders). It's matted on the Lacy Ovals Nestabilities (Spellbinders). I distressed the edges of the image a bit with Vintage Photo Distress Ink and some 7Gypsies stamps. The border punch is Martha Stewart. 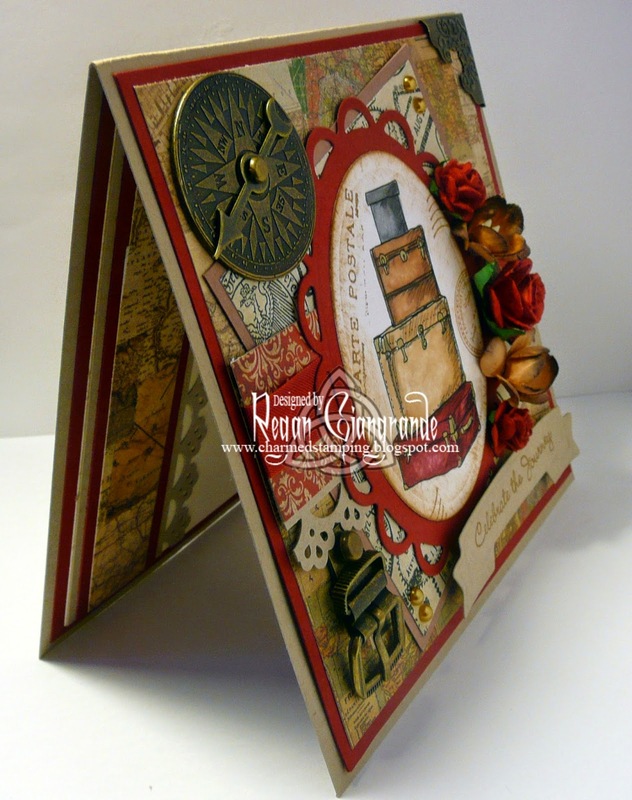 I added seam binding , flowers, and some Tim Holtz goodies (Compass Coin, Game Spinner, Corner, and Buckle). The sentiment is from My Favorite Things and a set called Goin' Places. 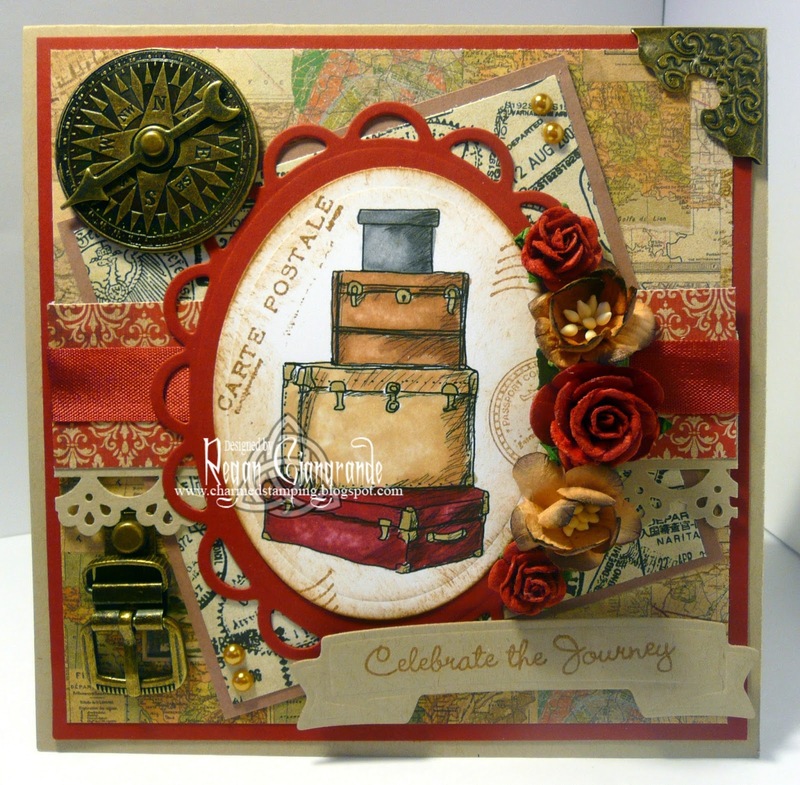 I cut it with one of the Ribbon Banners dies (Spellbinders). Papers are Teresa Collins - World Traveler. 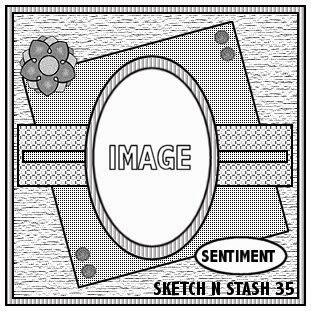 Sketch is from Sketch n Stash (#139). Happy Memorial Day to all my US followers! It's the unofficial start to Summer and a day to remember all those who have died serving their country. We are off to a parade and rubber ducky race then a cookout at my brother's. The weather is supposed to be perfect so we couldn't ask for anything more in a holiday (and day off from work)! Markers used: Copics (E23, E25, E31, E33, E34, Y28, R39, R89, N2, N4, N6). such a beautiful card! great take on the sketch! Thanks for joining us at Sketch N Stash challenge! Beautiful image!! Love your coloring.. You have made to give the suitcases 3D effect with your coloring!! FAB colors and Great Metal Embellishment!! and 2x Bingo!! :o) Well done! !